Welcome to the Dunkirk Harbour Museum! Whether you are here with your family, a group, your class or among friends, the history of the privateer town and its harbour is here for you to discover! With 1,600 square meters (over 17,000 square feet) of exhibitions, 4 centuries of history, 500 works (models, videos, paintings, …) and 5 locations to visit (the Museum, 3 ships and the Risban lighthouse), we offer many ways to embark on a maritime adventure! Check our Opening Hours and our Entrance Fees! 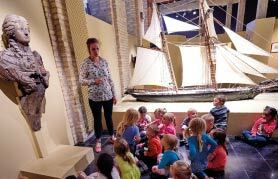 Located in the heart of the Citadelle (Dunkirk’s historic part of town), set within a former 19th century tobacco warehouse, our museum will take you on a journey through the history of the harbour of Dunkirk. Travelling through four centuries, you will discover men and women whose hard work helped build and expand the port and its area. Thus you will learn about harbour operations and how, from Iceland to Cape Horn, from Africa to Asia, the people of Dunkirk have ventured all across the seven seas. Models, paintings, worktools, photos and multimedia will take you away on an expedition through time, around the world and back! Opposite the museum, three outstanding floating pieces of history await: the three-master Duchesse Anne and the lightship Sandettié, both Monuments Historiques (French National Heritage), as well as the barge Guilde. Aboard the majestic three-master Duchesse Anne, a former training ship, you will discover the crew’s quarters and their living conditions, from the ‘tween deck (for cadets) to the sumptuous Commander’s cabin. Launched in 1901 under the name Grossherzogin Elisabeth, this full-rigged three-master was used to train aspiring officers and sailors of the German merchant navy. For 30 years, it plied the Baltic Sea or sailed off the coasts of Africa and South America with between 130 and 200 cadets onboard, overseen by a crew of between 15 and 20 officers, subordinate or petty officers and enlisted men. After its purchase by the city of Dunkirk in 1981 for a token sum, the association Les Amis de la Duchesse Anne started its restoration in March 1982 under the presidency of Benoît Venturini. On the 22nd of August 1998, after being restored following traditional ship-building techniques, it reached its final destination, facing the Harbour Museum of Dunkirk. With some of the work still under way, the Duchesse Anne had to wait until 2001, on its 100-year anniversary, to greet its first visitor, after 19 years of renovation. The lightship Sandettié was a stationary ship. With its powerful light and foghorn, it guided other ships through the dangerous sandbanks off the coast of Dunkirk. Commissioned in 1949, the BF 6 (bateau-feu 6 – lightship 6) was successively named Dyck and Sandettié, after the sandbanks it was ordered to guard. For every new assignment, the new name was painted in large white letters onto the hull. The crew of this destinationless ship was made up of 8 men in charge of maintaining the ship and its lighting system, carrying out and transmitting weather observations or just keeping watch over the navigation channel. A major chapter in the maritime history of the city of Dunkirk was closed when the lightship Sandettié returned to port for the last time on the 3rd of June 1989, saluted by the sound of many shiphorns. Owned by the Urban Community of Dunkirk since 1997, it was restored and opened to public in 2006. Since, Bernard Quilliot (former Head Mechanic aboard the Sandettié) has regularly given guided tours of the ship. The barge Guilde invites you to discover the world of waterway transport, a part of the harbour universe which is often less familiar to the public, but still as fascinating. Within the floating museum, the barge Guilde proves the utmost importance of inland waterway shipping to move merchandise from the inland to the harbour. Its history illustrates the different steps of the evolution of 20th century waterway transport. Built for the Freycinet large loading gauge canal, this barge was at first owned by a shipping company using it for the transport of coal and construction sand. Being non motorised, it was then pulled from the banks by motorised tractors. From a height of 60 meters (approximately 200 feet), enjoy an breathtaking view of the city, its harbor and the North sea! Built in 1842, the lighthouse is emblematic to the city of Dunkirk and has been open to visitors since 2012. Located in the vicinity of the city centre, the lighhouse dominates the harbour and offers a spectacular view of the sea, the town and its agglomeration and the French Flemish countryside. It is the northernmost lighthouse in France and reaches a height of 66 meters (216 feet) above sea level. After climbing its 276 steps, you will be looking at its lamp (equipped with a Fresnel lens), with a range of over 50 kilometers (30 miles). The lighthouse was erected in 1842 on the ruins of Fort Risban, which was a part of the fortifications by Vauban (at the end of the 17th century). Severely damaged during WWII, the lighthouse had to undergo major repairs in 1946 and was fully automated in 1985. It was then restored in 1992 and registered as Monument Historique (French National Heritage) in November 2010. Works were carried out in 2012 to enhance the visitor experience and to create a reception room and an area dedicated to marine aids to navigation. These renovation works were undertaken with the support of the European Union as part of the HMS project (INTERREG IV A 2 seas programme) and of the Région Nord-Pas de Calais. Through the history of the lighthouse, we address the topics of navigational aids, buoys and those in charge of them, as well as the technical aspects and technological breakthroughs in the field of maritime buoyage and beacons. Parts of the exhibition also debate the future of such establishments in a modern urban and maritime approach, while some others deal with the social and cultural imagery of the lighthouse. The Phares et Balises (Lighthouses and Maritime Aids) subdivision has collaborated to the creation of these areas of the exhibition, providing the museum with numerous items of this collection. In addition to our permanent exhibition, the floating museum and the lighthouse, the Harbour Museum of Dunkirk hosts every year a temporary exhibition. This year, we have chosen to present the world of piracy in a 200 square meter (over 2,000 square feet) area. Our documentation center offers various documentary and literary resources specialised in portuary and maritime topics. Access is free, by appointment. Visitors will be assisted by our documentalists, according to their information needs. As a rule, documents are available for on site consultation, but loans can be arranged under specific conditions (such as instructional purposes).